This week at the CSA pick-ups: amazing pottery for an amazing cause! See the poster below for more details, but make sure to come to your CSA pick-up with some extra cash in your pocket. 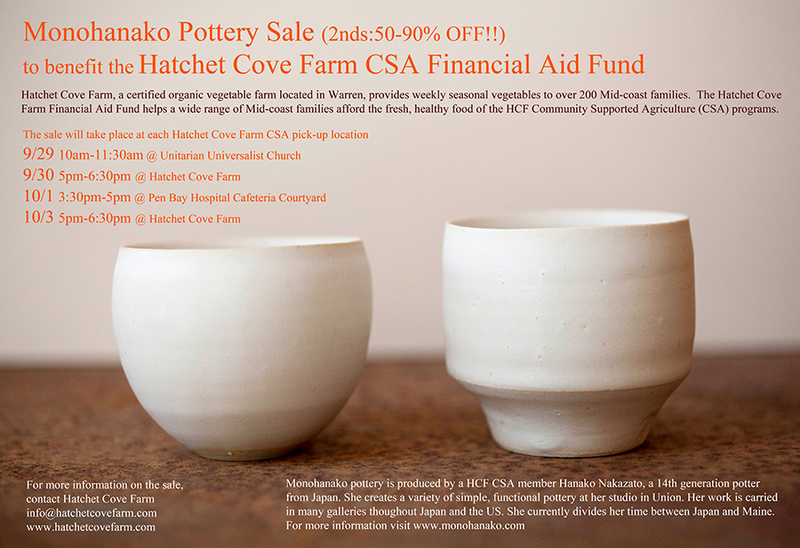 You’ll get wonderful pottery at a huge discount and contribute to the CSA Financial Aid Fund. Can’t get better than that! Another awesome CSA Financial Aid Fundraiser! Next Saturday, October 5th, from 11am-7pm at Duo’s Fish n’Chips Takeout in Rockland (734 Main Street)! The Rock Coast Rollers will be your carhops and a portion of the proceeds from the day will go toward the CSA Financial Aid Fund. It’s Duo’s last day of the season, so come have delicious fish n’chips and support RCR and the HCF fund! October 6th—Rock Coast Rollers tryouts! OK, ok, perhaps this is a stretch for some of you. But if you’re female and over 18 (or if you’re a guy and you’re interested in becoming a referee), come check out what local roller derby is all about! 10am-noon or 2-4pm at the Point Lookout gym in Northport. Saturday, October 20th starting at 1pm: the 6th annual HCF cider-pressing, garlic-popping CSA potluck party! It’s been a banner apple year and we might even have a big new hydraulic cider press working by then, so come with your apples, a potluck item, a blanket and be ready to explore the farm and relax on the lawn. There’s always great food and great company, and we’ll give a farm tour at 2:30pm. Come hang out with us for the afternoon on the farm! Sign up now for the fall CSA (http://tinyurl.com/fallcsa2013)! Four weeks (mid-Oct to mid-Nov for $60) of a smaller CSA share full of fresh salad greens, root crops, onions, shallots, kale, and more. Sign up soon — space is filling up fast. 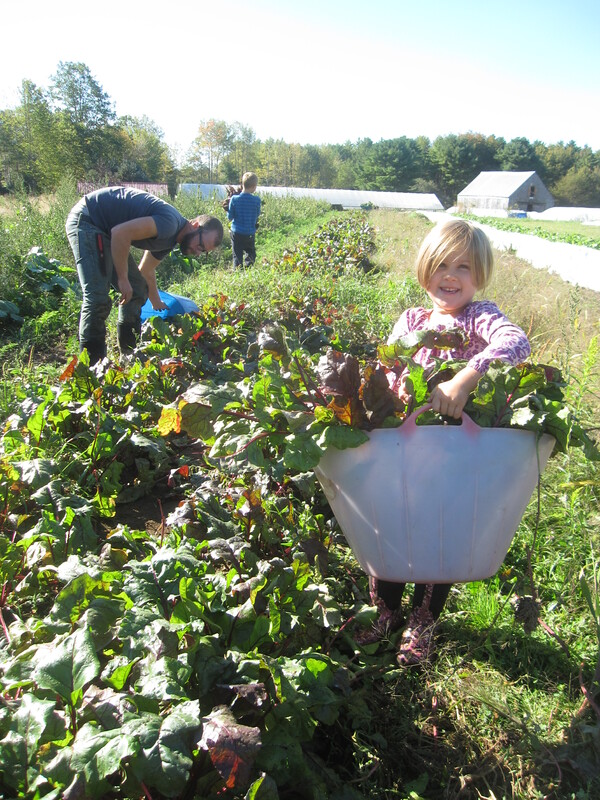 The only traditional pick-up will be at the First Universalist church in Rockland on Sundays, but you can sign up for Sunday but pick up your share on another day out of the walk-in at the farm. Just send us an email so that we know that is your plan.In addition to the regular add-on shares of FIORE oil & vinegar, cheese, mushrooms, eggs and pork, our wonderful apprentice Zoë Mason will be baking bread for a four-week fall bread share! The cost will be $5.25 per week for a loaf of fresh bread baked with King Arthur flours. Zoë has worked at local bakeries including Treats Bakery and Hootenany Bread and she is excited to branch out on her own with this small venture for our members. And finally, in veggie news, we’re happy to have hakurei turnips for you this week! Some say that they’re melon-like, but I think of them as creamy. They’re fresh-eating turnips, not intended to be cooked. Slice them up and crunch on them raw like carrots, or in a salad or a slaw. They’re delicious. Have a wonderful week, please get in touch with any questions, and see you soon! We had extra strong beet harvesters in the field on Saturday morning.